To assess the diagnostic capacity of intraoperative neurophysiological monitoring with respect to “gold standard” microscopic findings of facial canal dehiscence in middle ear cholesteatoma surgery. 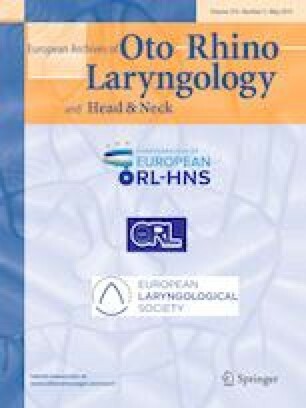 We carried out a retrospective cohort study of 57 surgical interventions for cholesteatoma between 2008 and 2013 at Hospital Universitario de Canarias, Spain. Each patient underwent preoperative computed tomography (CT), intraoperative neurophysiological monitoring and intraoperative inspection of the facial nerve during microsurgery. Diagnostic concordance on the presence/absence of facial canal dehiscence was assessed in 54 surgical interventions. Presence of facial canal dehiscence. Of 57 interventions, 39 were primary surgeries; 11 (28.2%) showed facial canal dehiscence. and 18 were revision surgeries; 6 (33.3%) showed facial canal dehiscence. The facial nerve was not damaged in any patient. Facial canal dehiscence was observed in 17 (29.82%) interventions. We used intraoperative microscopic findings as the gold standard. Neurophysiological study showed a sensitivity of 94.1, specificity 97.3, positive predictive value (PPV) 57.8 and negative predictive value of 97.2. CT showed a sensitivity of 64.7, specificity 78.4, PPV 57.8 and negative predictive value of 82. Our neurophysiological study showed greater sensitivity and higher PPV than CT for the detection of facial canal dehiscence. We found no relationship between disease progression time and the presence of facial canal dehiscence. This study was performed without funding. Francisco Arias-Marzán declares that he has no conflict of interest; Gemma de Lucas-Carmona declares that she has no conflict of interest; Esteban Reinaldo Pacheco-Coronel declares that he has no conflict of interest; Pedro Javier Pérez Lorensu declares that he has no conflict of interest; Alejandro Jiménez-Sosa declares that he has no conflict of interest; Blas Pérez-Piñero declares that he has no conflict of interest.